On a very cold Tuesday morning, 8 February 1994, I embarked on a 10-hour train ride from Copenhagen in Denmark to Arnhem in The Netherlands. My goal was to visit Mr. Johan Wolthuis, the secretary of the International 70mm Association. Some months earlier, in late 1993, some very interesting reels of 70mm film and a reel of 65mm film had been discovered at the Nederlands Filmmuseum in Amsterdam. These are my notes of what happened on Wednesday 9 February 1994. Just before 6:30 PM I met Johan at the Arnhem railway station. This was my first meeting with him and we soon got along well. We went to a local pizza restaurant to get something to eat. Our conversation focused on our planned "70mm Promotion Tour" to Los Angeles the following October  and the 65mm Todd-AO concept test reel recently found in the Amsterdam film museum. As it had been a very long day I went to bed before midnight. Eager to see what the test reel would reveal, I quickly fell asleep. The next day we went to the film museum in Amsterdam. After some searching we finally located the projection room, a very nice spacious room with a large square rewinding table in the middle. There are two cinemas there. Screen #1 has two DP70 projectors and screen #2 two Ernemann X projectors. The friendly projectionist staff greeted us with tea and coffee and soon the 65mm reel was on the rewind table for a closer look. First of all, the 65mm reel had no leaders or tails of any kind attached. The film material seemed to be in a very bad state. There were many splices throughout the reel. The projectionist Ron Salari was eager to get started and laced up the DP70 projector. Since there were many splices, I suggested that we check the whole reel by hand first, and then run it. There was no sound with these reels, of course. This article was first published in the 70mm Association Newsletter, Issue 31, March 1994. 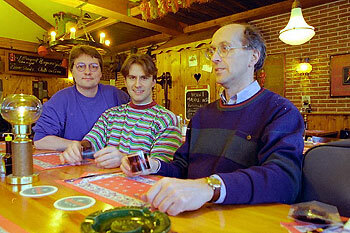 This is a revised version, updated February 2005. The 65mm reel started with a scene, which had faded to purple. It was a scene with a man and a woman sitting in a 2-horse horse carriage with a fringe on top. Just like the one used in "Oklahoma!". The actors were unknown to me. There were also two male production crewmembers in this scene. From the slate I could read: (scene) 10X (take) 1, Date 8-3. Prod MGM, Day - Exterior, Director: Zinnemann. Cameraman: (Harry) Stradling. "Test". The lens used was clearly a wide angle lens as trees in the scene were curved. Possibly the Todd-AO 128 degree "bug eye" lens. It was filmed 3 August 1953. Rollercoaster scene photographed at the Far Rockaway Playland’s “Atom Smasher” coaster. 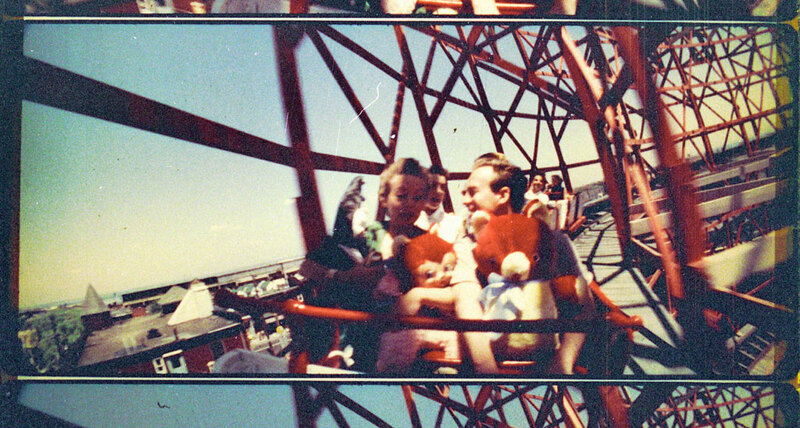 The camera faced the people in the rollercoaster, one of who, was actress Evelyn Keyes, then-girlfriend of Mike Todd. The camera was a 23-old vintage 65mm Thomascolor camera rebuilt by Henry Cole (American Optical Company) and Mitchell, and fitted with the bug eye lens. This piece of film was mirrored so everything was laterally reversed. To my amazement this sequence had outstanding color. Considering its age [dating back to 1953] it had not faded significantly. Consolidated Film Laboratories in Fort Lee (NJ), USA, developed the first Todd-AO tests in the Ansco color process, which was different chemestry than the fade-prone Eastman stock of the era. There were no markings on the 65mm stock used. The exterior scene was slated: Todd-A.O. lens test 6/15/53, 12-1, 65mm 24F - 28. Michael Todd is clearly seen in the shade to the right at the very end of this scene looking into the camera. He is wearing a red-white-black lumberjack T-shirt. This was a historical scene, as it was the first day of shooting with the rebuilt Thomascolor camera and the new 128 degree wide angle lens, 15 June 1953. Exterior scene. A sunny day on a beach. Michael Todd is here seen next to his assistant who holds a slate with the text: Todd-A.O. lens test 17 -2, 65mm 30f - (?). Evelyn Keyes and friend on a blanket on a sunny day. Three beautiful young women dressed in 1953 beach attire stand next to them. The sequence was also flipped. There were several short sequences from the same beach set up. Likely also filmed 15 June 1953. Carriage scene. Faded to the same color as scene #1 and included more footage with the young couple in the carriage. This scene was dated August 3. Probably 1953. This time it was a well focused close-up of the happy couple. It was marked "11 take 1". 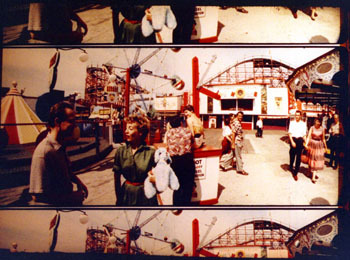 Rockaway Playland. Static scene. Filmed in 65mm 30 fps, day - exterior. Merry-go-rounds are moving at both sides of the scene. Plenty of people move back and forth in front of the camera. Again Evelyn Keyes and friend in the picture. The colors were very good. Very little fading. Rollercoaster scene photographed at the Far Rockaway Playland’s “Atom Smasher” coaster. The sequence had color and was slated: 65mm 24 fps, 15/6/53, 11 - 3 lens test 128. Again Evelyn Keyes and friend in the picture. They look different from the couple in the carriage. Carriage scene with happy young couple. Faded too, as sequence #1. There were close-ups as well as totals of the carriage moving fast from right to left while the camera followed the action. Filmed in 24 fps. Prod: MGM. Filmed 8 August 1953. Three identical views of Niagara Falls photographed from the air. It was a magnificent sight. The colors were fair. The right side of the frame was heavily vignetted (almost 6% of the 65mm frame area was black). More carriage scenes like scene #1. The lenses used were both long and short. The last sequence was slated: Take 3. 30 fps. The running time of the Todd-AO demonstration 65mm reel was approximately 15-17 minutes (show began 12:33 and ended 12:50). As there were different frame speeds (both 24 fps and 30 fps) mingled, it was very difficult to time it correctly. Additionally the projector speed began at 17 frames per second because of the poor state of the reel. Projectionist Ron Salari later increased the speed to circa 27 frames per second. I would guess the whole reel, if projected at the right speed, would play 14 minutes. The whole reel was heavily scratched on both sides of the film and there were many splices as if the reel had once been longer. The reel carried no leader or tail. This reel of 65mm film apparently came from the Philips Congress Centre in Eindhoven, which was closed and demolished in 1991. Why the footage was in Eindhoven is anybody’s guess. It could have been used for setting up the DP70 projector at Philips Electro Acoustive Division ELA studio when the machine was developed in 1954. The reel was then forgotten for nearly 40 years and re-surfaced when the place was gutted. 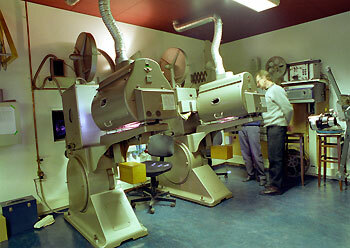 The DP70 installed in the Dutch film museum (SN #2394, from Philips Congress Centre in Eindhoven) had no difficulties running 65mm film through a 70mm gate. 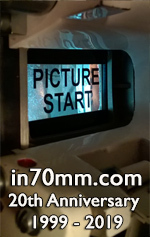 In advertisements the DP70 was originally promoted as being suitable for 65mm film. 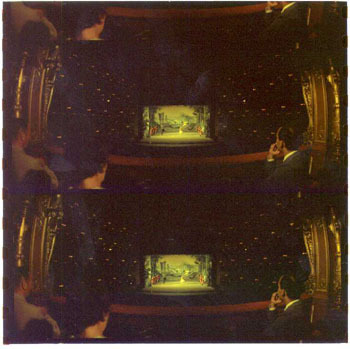 The scenes were probably some of the same scenes used on the night of 14 August 1953 in the Regent Theatre in Buffalo (NY) USA, which was the first public display of the Todd-AO concept and technique. The demonstration eventually convinced Rodgers & Hammerstein II that Todd-AO was a superior process compared with Cinerama, and they sold film-making rights for "Oklahoma!" to Magna. Reel number two contained a very short sequence in 70mm black and white. It was silent and it appeared to be photographed on a parking lot. In front of the camera lens something like a large fish net with very large squares and three men could be seen. Each person held a large piece of black beaverboard with the white text (probably written in chalk). The numbers "15" (4,57 m), "50" (15,24 m) and "90" (27,43 m), maybe referring to the distance in feet from the lens. Where it was photographed is a mystery. Since it was black and white I would assume it is a very early test of camera lenses but that is only guesswork. Then followed two sequences from "The Miracle of Todd-AO". The first sequence was with young skiers in Sun Valley, Idaho, followed by the Harley Davidson motorcycle ride into San Francisco. It ended with 4 different scenes depicting cinemas showcasing "Oklahoma!" with bright flashy neon signs. The beginning of "Oklahoma!" appeared. All main titles were removed, however. Gordon MacRae sang "Oh, what a beautiful morning'" and "The surrey with the fringe on top" in 6.-track magnetic stereophonic sound. At the edge of the film it said "Kodak . 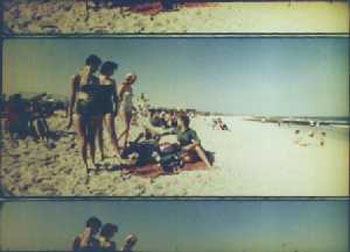 (one black dot) S.afety film" indicating this 70mm stock was made in the United States in 1956. 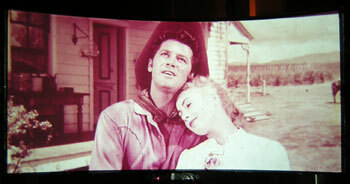 The “Oklahoma!” sequence was so faded and fragile that the emulsion nearly came off the film base. The "Oklahoma!" reel had neither a head nor an end attached. Towards the end of the day, Mr Wouter de Voogd of Amsterdam joined Johan and me in a restaurant where we had dinner and a good talk about the demonstration reels and 70mm film in general. Both Johan and I were very happy and excited afterwards. Not many people have seen these sequences for nearly half a century. There are many questions regarding these Todd-AO demonstrations tests. Where are the 65mm negatives today? Who are the people appearing in the demonstrations? Only actress Evelyn Keyes, Michael Todd, director Fred Zinnemann and cinematographer Harry Stradling, ASC have been identified. Who are the rest of the people appearing on film? Unable to answer this right away, I returned to Copenhagen shortly afterwards via a direct coach from Amsterdam to Copenhagen. It had been a magnificent day with good company and the hospitality of the Dutch Film Museum had been superb. I would like to thank the Nederlands Film Museum for making this screening possible for me, and Johan for making all the necessary arrangements. Niagara Falls photographed from the air. Horse drawn carriage with two people in various situations. Beautiful young women in swimsuits next to a pool. Venice's La Fenice opera house.